These low-carb egg muffins are perfect for a grab-and-go breakfast! And my popular egg muffins are low-carb, Keto, low-glycemic, gluten-free, and South Beach Diet friendly and can easily be Whole 30 or Paleo; use the Diet-Type Index to find more recipes like this one. Click here to PIN Low-Carb Egg Muffins! Many (many!) years ago I came up with the name Egg Muffins for these little little low-carb mini-quiches baked in muffin cups, and I think they’re perfect for a grab-and-go breakfast. I’ve been making egg muffins since 2005, going through a few versions to get the recipe just right, and there’s no doubt that this is one of the most popular recipes on my blog. And I’m pretty confident that my blog is the very first site that called these little baked egg cups by the name “Egg Muffins,” although now the name has spread and you can see them called that all over the web. If this is your first time making something like this, I’ve picked up a few tricks that I think you’ll like. 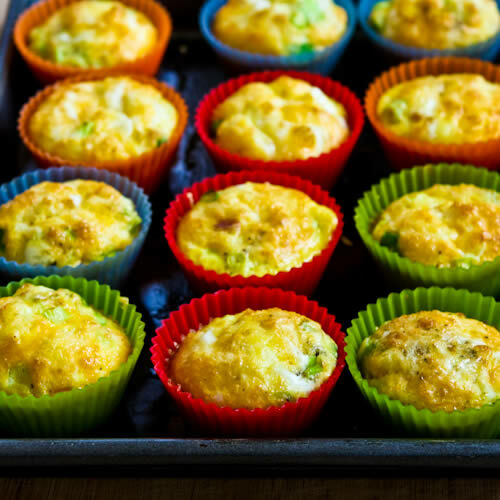 I don’t think of egg muffins as only for people who are following a low-carb eating plan or the South Beach Diet, although they’re perfect for any carb-conscious eater. These little breakfast treats are high in protein, gluten-free, and perfect to feed to kids. This is a great idea for breakfast for anyone who’s busy in the morning and wants something that can be made ahead and eaten on-the-go. 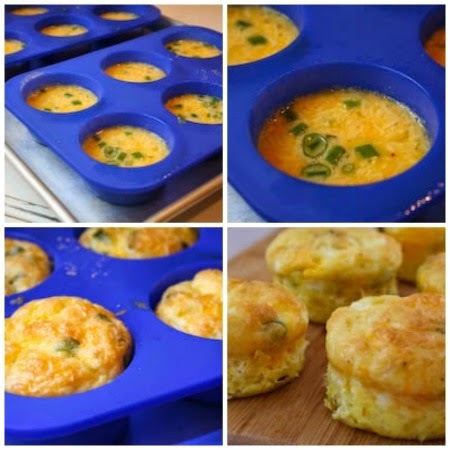 For quite a few years I made Egg Muffins in a Silicone Muffin Pan, and they work fine if that’s what you have. This type of pan will make a flatter muffin than the individual muffin cups I use now. Now I greatly prefer individual Silicone Muffin Cups. Whether you use silicone muffin pans or individual silicone cups, spray them with nonstick spray, and put them on a large cookie sheet to catch spills. The two ingredients I think are essential are cheese and green onions; other than that, the varieties are endless. 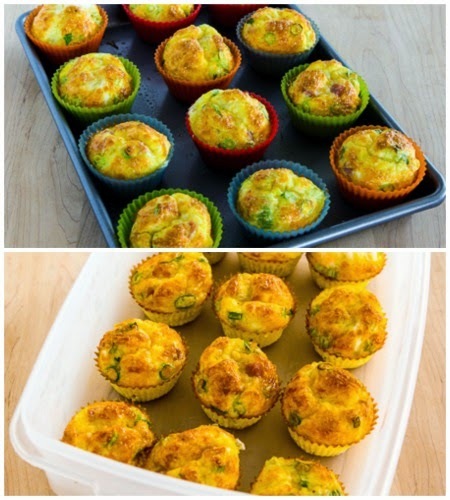 Put cheese, meat, or veggies in the muffin cups first, then pour in beaten eggs. Let the muffins cool for 15-20 minutes before you store them in the refrigerator. (I used to freeze them, but I find they keep in the fridge for over a week and I like them best when they haven’t been frozen.) For me, two small muffins is the right amount for breakfast. I microwave for about 45 seconds and breakfast is ready! (Don’t cook to long or the eggs can get rubbery. The options really are endless, but the Green Chile and Cheese Egg Muffins shown here are one of my favorites. Hope you have fun experimenting with the recipe! These low-carb egg muffins are perfect for a grab-and-go breakfast! Break eggs into large measuring bowl with pour spout, add Spike, and pepper (if using) and beat well. Pour egg into each muffin cup until it is 3/4 full. I like to stir slightly with a fork. Bake 25-35 minutes until muffins have risen and are slightly browned and set. Here is more about Spike Seasoning if you’re not familiar with it. These Egg Muffins are a perfect breakfast for any type of low-carb eating plan, and if you use the right ingredients these can easily be Keto, Paleo, or Whole 30. With lower-fat dairy and the right ingredients they’re also perfect for any phase of the South Beach Diet. Pam, every version would be different, depending on what kinds of meat, cheese, and veggies you used. I don't count calories, but if you need that information there's a link under FAQ for Calorie Count, which is a site where you can enter the recipe and it calculates it for you. How many calories did one Egg Muffin account for? Barbara, going to check it out now! Kalyn – Today I posted a pressure cooker version of your egg muffins on Pressure Cooking Today. Such a great idea. Thanks! I think that sounds like a delicious version! Hi Kalyn, I'm trying phase 1 of SBD today. I started out by making these muffins and they came out terrific! I used 1 thin slice of feta cheese per cup, 1 slice of deli ham folded to fit the cup, 1 green onion and 3 whole mushrooms, both chopped up and spread throughout the cups. I only needed 8 eggs to fill my 12 cups. They came out a little small, so I ate 3 and bagged them in 3s. Still works for me! Thanks for sharing! SassyGirl, no problem. I think that's just two different names for the same thing, but it will definitely work! I misread the recipe and bought shredded cheese instead of grated cheese…do you think that would work as well? They turned out great! Big hit! Even the kids liked them!!! Thank you! I am about to make these for a Passover Seder. Here's hoping! 🙂 Making them with a little turkey bacon, sharp cheddar, red pepper, and a spinach and herb dip mix from Tastefully Simple. The muffins do rise a little in the oven and sink down slightly when you take them out. I would advise not beating the eggs too much; that will keep them from rising quite so high. You muffin cups might be slightly bigger too, and adding a couple more eggs might work better for the size you have. No worries though; they will still taste good. I've just tried your egg muffin recipe because I think its super easy and looks so yummy. Thanx for the delicious recipe! But I was confused that my muffin sort of shrinking after I took it out of the oven 🙂 Can you please help figure out why? So I beat the eggs with some seasoning (I don't know if our store here in Indonesia has Spike or not, but I just wanna make those muffin right then), put bits of sausages, green onion, and cheese, then pour the egg. I set my oven for 15 minutes, coz its the max timer available. I don't really remember when, but I saw the muffin started to go up and up and up. I called my hubby and we cheered it up (silly eh :p). When it finally done, we took it out….and we saw… it was going down and down and down 🙁 What did I do wrong? Please help, did I miss any step? Are muffins really going up in the oven then flat down once they cool down outside of the oven? Dana, I'm not sure you will get the ingredients as evenly distributed that way (I'm thinking you'll end up with a lot more of the filling ingredients in some muffins and hardly any in others.) But try it and see if you'd like. These look good, but I was wondering if instead of layering the ingredients, they could all be mixed well together then poured/scooped into the muffin tin. It seems like it would be easier this way. Is there any reason why this wouldn't work? Thanks! These are brilliant! I have hope for getting my mornings started in the healthiest way with these on hand. They are cooling now, smell delicious, and look even better. Thank you! Momnmissouri, the amount of eggs will vary depending on the other ingredients and the muffin tin size, no worries! I made these tonight and they look great, but only used 10 large eggs. Wonder if I did something wrong? Too much filling maybe? Made these today. Good stuff. I used 6 whole large eggs and 12 large egg whites, seasonings, green onions and 4 pieces of bacon (minced). The nutritional content (per "muffin"/made 12 reg muffin tin sized muffins) is as so: 67 cal, 3.75g fat, .25g carb, 8g protein. With the being said, two muffins will be a great breakfast. Thanks for posting this recipe! LindsayLou, they almost always sink down as they cool, no worries! Mine looked so beautiful when they came out of the oven but deflated. They taste good though & looking forward to bringing them to work! Lisa, there is a link in the recipe for a site where you can enter the data to calculate it. Found your recipe on Pinterest and made it today – can't wait to try tomorrow! I'm on Weight Watchers, so do you have any idea of the nutritional value so I can input for points and figure out the rest of my day's food? Susan, just saw the question about freezing. I like them best when they're just refrigerated, and since they keep 7-8 days in the fridge, I rarely freeze them any more. Thanks Susan, and that is so fun that you're Nicole's sister-in-law! So are you Ben's sister or are you also married to a Bibler? I think Nicole and Ben are such a great couple, and I love their girls too! Maybe we will meet in person some day. I love your blog, I follow it on Pinterest also . I found out that I have a relative that s related to you, Nicole Bibler is my sister in law! You have great recipes and I can't wait to try more recipes. Sarah-Jane, I chose South Beach to manage my weight partly so I wouldn't have to count calories, points, carbs, or fat grams, so if you want nutritional information you will have to calculate it yourself. There's a link in the recipe for an online site I recommend for doing that. Carrie, thanks for sharing that great idea. I think I will try it myself, and if I end up posting the recipe I will credit you! I was inspired by your recipe to try a vegan version. I preheated the oven to 400 degrees Fahrenheit. Then I drained two packages of extra-firm silken tofu, crumbled them into the food processor, and pureed until smooth. I added a teaspoon or so of turmeric for color, just pureed it in, and a dash of salt and pepper. I then caramelized a large chopped onion in vegetable oil. Once the onion was mostly done, I crumbled vegetarian sausage substitute into the pan and browned it with the onion. I folded the onion-sausage mixture into the pureed tofu. I greased a metal 12-cup muffin pan with Pam and spooned the tofu mixture into the cups, filling them to the top but not mounding over. I didn't use liners or anything. Then I baked for about 30 minutes, until the muffins were nicely browned. I'm eating one this morning and they turned out great! I'm not even vegan — just wanted to try something different. Pureed tofu works great when cooked like scrambled eggs, so I figured it might work in this recipe, and it does! Bonus — I had no trouble with the tofu mixture sticking to the muffin pan 🙂 The muffins slid right out with no residue left behind. Thanks for the inspiration! I used your recipe as a base for my own version, and it turned out wonderful! My husband and baby loved them, too 🙂 I posted it over on my blog with a link to your post. Thanks! 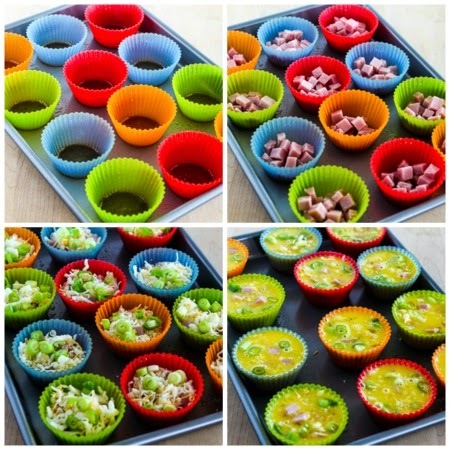 whenpigsfly, I believe strongly in letting readers make their own choices about food and other cooking related things, so if you are concerned about the safety of silicone muffin cups, by all means do not use them. My husband and I just gone done making these for Sunday breakfast. They are yummy! I'm glad to have an easy breakfast for during the week to alternate with steel cut oats. This time we only used the cheese and green onions with the eggs. Next week, we plan on adding turkey sausage. Becky, what a nice mom you are. I'm not teaching any more, but when I did I sure ate these in the car on the way to work a lot of mornings! Shared this link on my blog today! Made them yesterday, big hit with the kids! Thanks! Yes, I think that would work fine, but I would still spray them with olive oil or non-stick spray. Would these come out okay if I made them in ramekins or small oven safe mugs? I definitely think you could reheat them in a toaster oven. I might undercook slightly when you bake them, and maybe wrap in foil when you're heating them. Would love to hear how that works for you. Has anyone tried reheating these in a toaster oven? I no longer have a microwave and have no plans on replacing it. The moment I read through this recipe, I got started on it right away. I just popped them out of the oven and they look amazing. I haven't tried them but I'm sure they'll be great. I may try them with a little egg white mixture to cut the cholesterol. Anyone tried that? Thanks for the recipe! I don't beat the eggs too much, and the muffin cups I use are fairly small, but really you can make them anywhere from 3-4 bite size to larger, just adjust the cooking time. These are a BIG hit here. I made them in a flower shaped silicone pan and they were almost too cute to eat… then my 5 year inhaled three of them! Thanks for the idea! I'm trying them in the freezer… we'll see! Great recipe! An I like how you removed the milk. Eggs are lighter and fluffier without liquid added. Made mine with black beans, Gouda, green onions and Sazon (by Goya). Very, very good!! So glad people are still enjoying these! I've been making them for many, many years now.